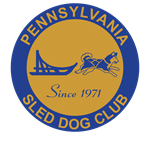 Thanks for visiting the Pennsylvania Sled Dog Club General Store! Find what you're looking for yourself or great gifts for your friends. Enjoy the PSDC branded t-shirts, sweatshirts, mugs, stickers, and more. A wide variety of gifts and novelties for your shopping pleasure. Like to write thank you notes? Maybe you want to cover your notebooks in PSDC stickers. Either way, we have you covered. Lunch bags! Laundry Bags! Tote Bags!